I think I may have said before that Australia is the land of ants. When travelling in Australia's arid regions (i.e. most of the continent), ants are often the most visible animals about. 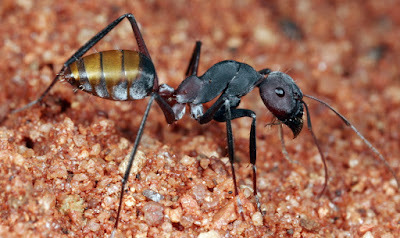 Perhaps the most visible of all Australia's ants are the meat ants (Iridomyrmex), but not too far behind them are the sugar ants of the genus Camponotus. 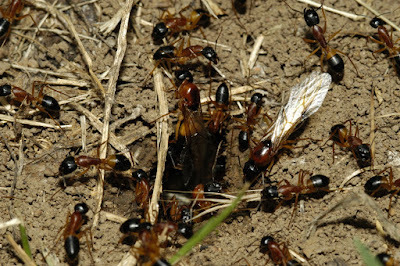 Workers and emerging queens of banded sugar ants Camponotus consobrinus around the nest opening, copyright Steve Shattuck. Camponotus is a genus of the ant subfamily Formicinae found pretty much everywhere around the world that ants are to be found. It is massively diverse: well over 1000 species have been assigned to this genus over the years, with probably more to be described. They are correspondingly diverse in habits and appearance. Some are among the giants of the ant world, others are much smaller. Some form massive colonies that are difficult to miss and forage during the day, others are more retiring and emerge only at night. Some construct their nests in holes under the grounds, others hollow out wood or use the holes left by other wood-boring insects. Most (but not all) Camponotus species exhibit some form of worker polymorphism: rather than having just a single worker caste, a colony will often include large major workers and much smaller minor workers, with the two forms superficially looking quite different. Sometimes the distinction between majors and minors will be quite clear, other times there will also be workers of intermediate sizes. In some Australian species, known as honeypot ants, there are specialised workers called 'repletes' who spend their lives hanging in one spot inside the nest, being fed by the other active workers until their gasters swell into engorged round balls. These repletes serve the colony as a living larder, able to regurgitate their stored excess of food when needed by their nestmates. Despite all this diversity, most Camponotus species are readily recognisable as Camponotus: they usually lack spines on the mesosoma (the 'thorax'), the back end of which is narrow and often arched. This smoothness and slimness gives Camponotus a distinctive look that kind of puts me in mind of the ant version of a greyhound. The majority of Camponotus species also differ from other ants in lacking the metapleural gland, a gland producing an antibiotic chemical whose opening is usually visible near the rear of the mesosoma. Camponotus aurocinctus, copyright Steve Shattuck. Camponotus species have been referred to in Australia as 'sugar ants' in reference to their diet, which is commonly dominated by the sugary excretions of plant-sucking bugs that they attend. In other parts of the world, they have sometimes been referred to as 'carpenter ants' in reference to the wood-tunneling habits of their most notorious representatives. Bug-derived honeydew is high in sugar but low in other essential nutrients, so the ants also feed on things such as the scavenged bodies of the bugs themselves after death. They are also probably assisted in meeting their nutritive needs by Blochmannia, an endosymbiotic bacterium that infests specialised cells in the gut of Camponotus and closely related genera (Wernegreen et al. 2009). 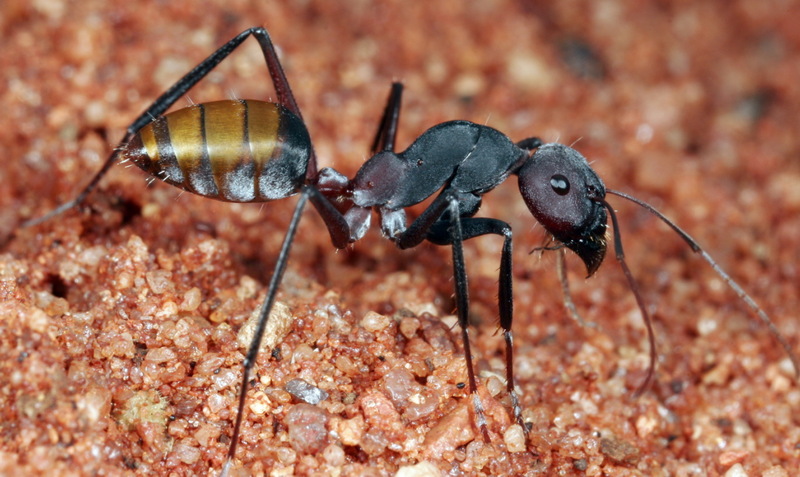 Genetic data from the endosymbiont indicates that it probably synthesises nutrients the ant does not otherwise ingest. It may also play some role in compensating for an absence of metapleural gland secretions. As well as the gut, Blochmannia infest the ovaries of reproductive females and are passed to the next generation via the developing oocytes. Phylogenetic analysis of Blochmannia indicates that it is closely related to other endosymbiotic bacteria found in mealybugs, and it is possible that the ancestors of Camponotus picked it up in the course of feeding on honeydew. Honeypot ant Camponotus inflatus repletes hanging in the nest, copyright Mike Gillam. The sheer size of Camponotus as a genus has been a challenge to understanding relationships within the genus. Over thirty subgenera have been proposed at one time or another, but many of these are poorly defined and many authors eschew using them in favour of informal species groups. It does not help matters that, since the early 20th century, most reviews of Camponotus have been conducted at a local rather than a global level. Those studies that have touched on Camponotus phylogeny in recent years suggest the need for a large-scale revision, with few of the subgenera supported as monophyletic. Wernegreen, J. J., S. N. Kauppinen, S. G. Brady & P. S. Ward. 2009. One nutritional symbiosis begat another: phylogenetic evidence that the ant tribe Camponotini acquired Blochmannia by tending sap-feeding insects. BMC Evolutionary Biology 9: 292. doi:10.1186/1471-2148-9-292. Thanks for the post, very interesting, especially the nutritional compensation provided by the endosymbiont. Not meaning at all to be picky on semantics, but I wonder if "infestation" is a right word here; I mean, it'd be interesting to know in this case (and maybe generalize, given enough independent instances) what was the nature of the initial association between Camponotus and Blochmannia and how it got stabilized as a new endosymbiosis starting from the bug endosymbiont. Speaking of hymenopterans, as an aside (just in case you didn't see it yet) I guess you may be interested in a Current Biology paper just out reporting on the evolutionary history of the group (Peter et al. http://www.cell.com/current-biology/fulltext/S0960-9822(17)30059-3). That should be Peters et al., btw. Thanks, Filippo. I feel reasonably happy with my choice of 'infest' (I just like the sound of the word). I haven't seen the paper you referred to; Current Biology isn't a journal that I have access to. Happy to send the pdf, in case. Thanks, Filippo. My e-mail is in my bio at the top right of this page.